Today's Armchair BEA topic is all about how book bloggers take the leap beyond virtual networking to make connections with authors, bookstores, and other book bloggers in real life. As a librarian, I'm fortunate to have real-life book experiences quite often, such as hosting author events with my library or going to conferences. 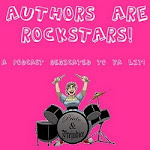 As co-host of the Authors are ROCKSTARS! podcast, I interview authors and do event coverage for book signings. One of the best parts of all of this is meeting other people who love reading just as much as I do. I always feel revitalized after making connections with authors, other librarians, and fellow book lovers. Make friends with your librarian or independent bookseller. Let them know you're a blogger, let them know what you read. Attend the events they host. When I get to know my regular patrons who love YA, I find myself taking note when I order books I think they'll enjoy, so I can tell them next time I see them. I set aside ARCs for them if I think they might be interested. I ask for and appreciate their input on authors to invite to speak at my library. Attend as many author events as you can. Not only will you get to meet authors you love, but fellow readers, too! In my experience, there are always a few book bloggers in the crowd at every book signing. Don't be shy in the signing line-- strike up a conversation with the people next to you. Attend conferences. BEA, ALA, NCTE, Kidlitcon... if they're in your area, don't miss out. BEA, ALA, and NCTE are large professional conferences, but people outside of publishing, libraries, and education may enjoy them as well. 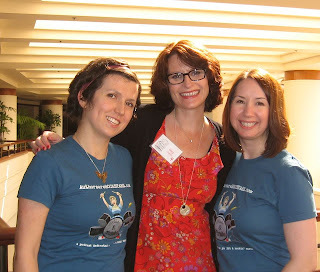 Kidlitcon is perhaps the most effective conference for blogger networking-- it's a smaller in scale, and is a great combination of authors, bloggers, and book lovers in general, with lots of opportunities for making personal connections. Read my Kidlitcon conference recap from last year, and mark your calendar for September 21 - 22 in New York this year. Also, if you'll be at ALA in Anaheim later this month, there's a YA blogger meetup happening. Hopefully I'll see you there! podcasts are so awesome for getting to know people! And it can be done form home, which is even better! This is some lovely advice! I go to lots of author signings- whatever is in my area. I love meeting up with bloggers and talking about books! It's so much fun. I'm also hoping to go to BEA or ALA next year, I'm crossing my fingers! I haven't heard of KidLit Con though, I'm definitely going to be checking it out now. I definitely think it's great to attend as much as you can. Unfortunately not a lot seems to happen locally, but I travel a bit as much as I can. Oh, your job is MY dream job :) The end goal of going back to get my MLS is to be a teen librarian. Working the library at the moment, our library focuses a lot on "art" stuff more than "authory" stuff. I wanted to feature an author interview that I did with a local author but it kind of fell dead. So sad. I would love to see that change though. We do have a bookstore locally that has had some monumental people like George RR Martin and Charlaine Harris but everyone just seems in such a bubble at those events.